Can you believe that May is almost over? I've said it before and I'll say it again: somebody needs to touch base with Mother Nature and let her know it's almost summer. I'm sure she keeps missing the memo because really, snow flurries in May? 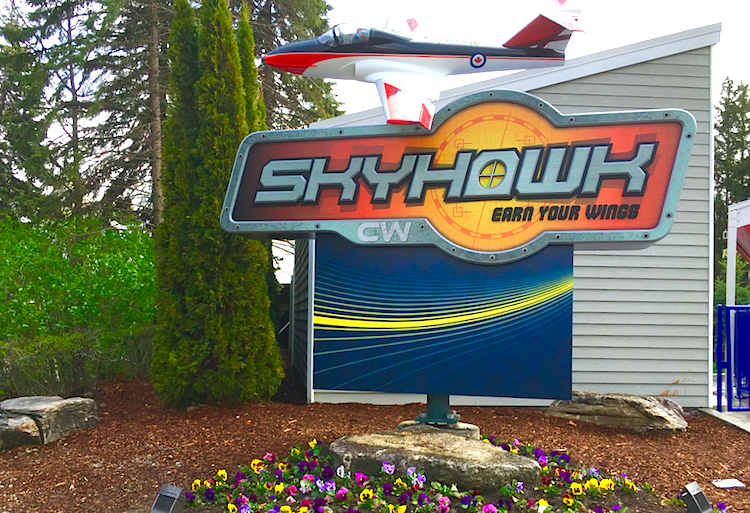 Recently, the family and I were invited to Canada's Wonderland to check out Skyhawk, their newest thrill ride, and, unseasonal weather notwithstanding, we braved the cold temperatures and ventured a trip to one of my favourite places to visit. The first of its kind in North America, Skyhawk is a 135 feet tall thrill ride where pilots in training can earn their wings. 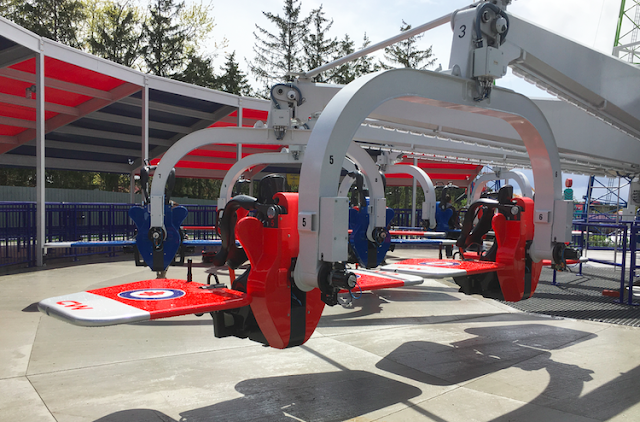 Riders are secured in single-person "airplane" that rotates in the air, granting them a stunning view of the amusement park grounds. Each rider is in control of their own cockpit and can manually raise or lower the wings in an attempt to complete a full 360 degree barrel roll. In fact, riders are challenged to beat the current record for the number of inversions during a single ride, which I believe currently sits at 59. Um, yeah. I think I'll pass on that challenge. The entire ride lasts about a minute and 30 seconds and is located in the Action Zone next to SlingShot. 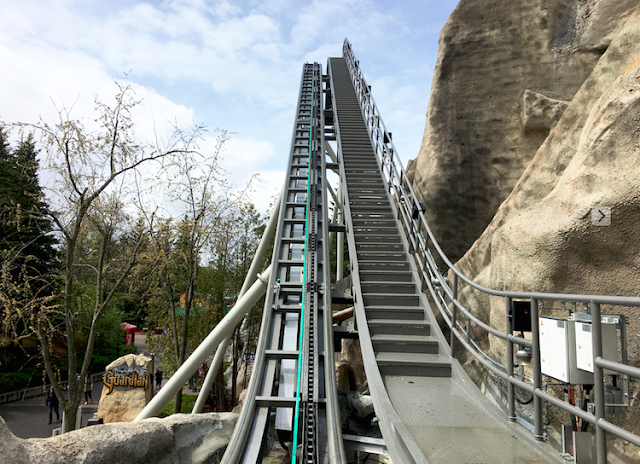 Skyhawk is also one of the many rides on the Fast Lane Plus lineup so you can beat the crowds. It has received a thrill rating of 5 which means it can be a pretty aggressive ride if you're trying to beat the record. 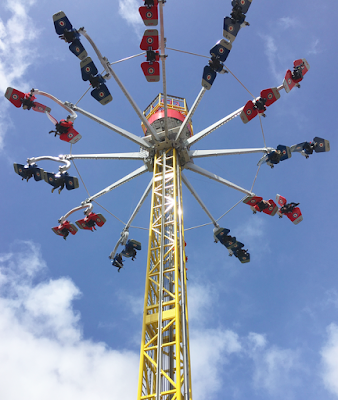 Riders must be at least 48" tall but for the younger pilots in training, they can try their hand at Flying Eagles. These two-person planes glide 28 feet above ground and allow each rider to control their flight and ride experience. 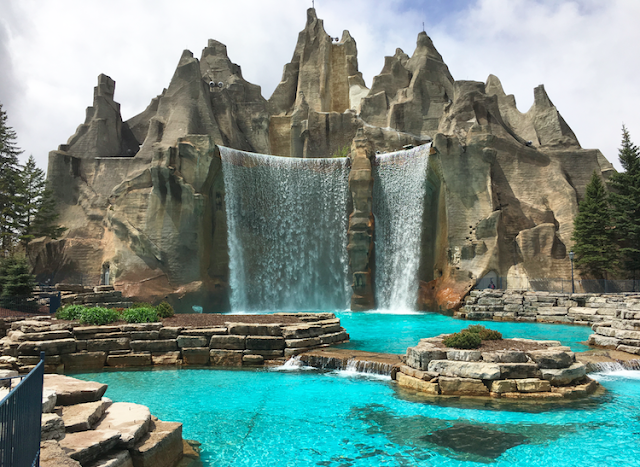 While at Canada's Wonderland, don't forget to stop by Wonder Mountain's Guardian, an innovative coaster ride into a world of mythical creatures. Each rider navigates through five different layers of a 4-dimensional medieval world where they will put their gaming skills to the test in a battle with guardians of the dragon's treasure. 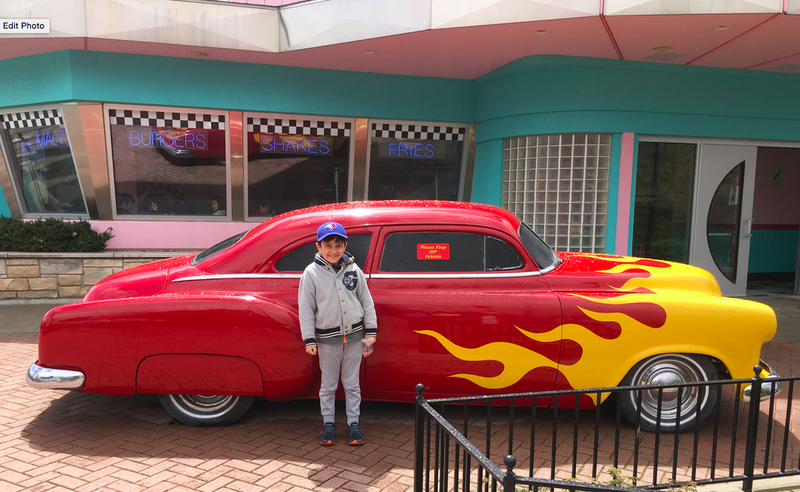 Once the quest is over and you've worked up an appetite, you can stop off at any of a myriad of dining locations throughout the park, including my son's favourite - Coasters Diner. Tickets to Canada's Wonderland are available online for as low as $35 for a 35th Birthday Ticket valid on May 23, 2016 only or $39.99 for a 3-day advance ticket. A season pass is only $69.99 which is a steal if you plan on going more than once but you'll need to hurry as prices go up May 23. Benefits include 15% off food and merchandise and, new for 2016, Season Pass renewals receive FREE admission to Dinosaurs Alive! Yeah, I hear ya. I might try a barrel roll but would be perfectly content taking in the views, too. Omgosh, this is frightening to me lol I'm sure it will be a blast for most folk, but I just can't do rides like this! The 360 degree spin might do me in but I would enjoy taking in the sights, even despite the heights. Same here! The weather did not really cooperate when we went so I hope to go back again this summer. It's funny because when I was a kid, I was a coaster demon. Now, I easily get nauseous so I have to limit the number of rides and take a break in between. I'm game. I'm never too old to take on a new ride. Love rides!! Wow that ride is crazy!! I love rides but that one combines my fear of heights with spinning & so it's a big no for me! But Canada's Wonderland offers a ton of other fun activities which I would love to go with my family one day. I haven't been to Canada's Wonderland in ages! Definitely on my to-do list. I love roller coasters but find that any rides that spin make me sick. I have a problem with balance so spinny rides make me sick BUT I'm totally up for any and ALL roller coasters! I have never brought the kids to Wonderland and the oldest is 7! Thanks for the pics, and the reminder that this should be the year! Thanks for the ticket info.....we haven't been in years! Would love to change that! Will be a must go to when we go out to visit! Not sure if I could do the ride though..would have to watch and observe it first! You would not catch me anywhere near that ride. I couldn't even watch it from close up. I love Canada's Wonderland and that ride looks exciting! I don't think that ride would sit well with me but I can guarantee you my kids would love it! The Skyhawk is right up my alley!! Even being old I could ride coasters all day, the bigger the better!! I'm sure someone in my family would love the new ride.....I can tell you, however, it wouldn't be me! Yikes! That ride sure looks interesting for the brave folks,it would not be for me ! I would love to ride it! I haven't been to Canada's Wonderland in such a long time. I need to bring my boys. Even just reading about the ride gives me butterflies in my stomach.